Before I start talking about our new system, let me back up and explain what I want out of our home security system in order from most important to least important. If there’s a fire, get the fire department there as soon as possible whether I’m home or not. If someone breaks in while we are gone, at least we’ll know about it. This is probably the most common reason people buy a system, and while I like the feature, it’s not a huge selling point for me. Frankly, we live in a very undesirable theft target. If you’re crazy/smart enough to break into our house, you’re going to do whatever you want regardless of whether I have an alarm system installed. I chose SimpliSafe. They’ve target my exact scenario and they’ve been around for long enough that I trust them to provide me with a good product. Create your system by figuring out how many of each type of sensor you want. I recommend that you start small because it’s really easy to add more later and the only additional cost is that you pay shipping each time you make an order. SimpliSafe will configure your new base station for the sensors you ordered and ship you a box. They say that setup takes 30 minutes and they’re right (depending on how many sensors you bought.) Setup is SOOOOO easy compared to what I went through before! Basically, you plug the base station into the wall, activate your account online and stick your keypad on the wall. For each sensor, remove the tag to connect the included battery and stick it on the wall. Unfortunately, my case wasn’t quite that simple. My base station came with a T-Mobile SIM card in it and the T-Mobile signal was so bad that I could only rarely get a connection from a single point in my house. After a lot of trial and error, SimpliSafe agreed to send me a replacement board for the base station that uses Verizon’s network instead of T-Mobile. That worked a lot better. Our monitoring is now $15/month but we dropped $55/month for the home phone and $10/month for our old monitoring company. So we are saving $50/month! We’ll recoup the ~$400 hardware cost in 8 months. I love these projects that cut out huge monthly bills! It’s much more fun to spend money when you know that you’re going to save that much in a short amount of time. 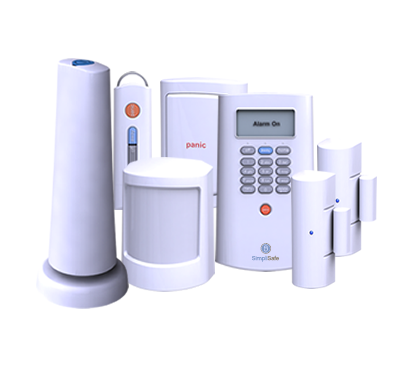 I also feel good using an alarm system that is easy to expand and modify whenever I want. I suppose there’s a chance that it’s less secure than my old system, but remember my priority list. I’m ok with that. I also don’t have any evidence that it IS less secure. My old system had plenty of wireless sensors and the landline was very easy to cut. A determined and intelligent burgler is going to know how to get through most consumer grade alarm systems anyway. The trick is to just be a more uninviting target than other people in your neighborhood. It’s kind of like hiking in bear country with somebody that runs more slowly than you.